Po celom svete sa prebúdzajú kresťania, spoločenstvá, zbory, cirkvi, teológovia, ktorí znovuobjavujú jasne ohlasované Evanjelium. Mnohí z vás chcete ísť hlbšie a dovedieť sa viac o radikálnej milosti, prijatí, jednoducho o Evanjeliu, ktoré sa kdesi na ceste storočiami zaprášilo. Chcete čítať o nádhere Kristovho diela aj od iných autorov. Preto som sa rozhodol v rámci mojich možností zháňať a ponúknuť vám literatúru, ktorá by vás mohla inšpirovať. Drvivá väčšina z nej bude v angličtine. Tieto knihy budem postupne dopĺňať tak, ako sa mi bude dariť ich zháňať. Ak máte o akúkoľvek z nich záujem, napíšte mi na zamyslenia (zavinac) rybka.sk. People who have stopped reading the Bible or never even read it before say about The Mirror, "I have never read anything that touched me so deeply, it is a brand new Bible, I cannot wait to give it to all my friends!" The Mirror Bible is a paraphrase from the original Greek text. While the detailed shades of meaning of every Greek word have been closely studied, this is done taking into account the consistent context of the entire chapter within the wider epistle, and bearing in mind the full context of Jesus as the revealer and redeemer of the image and likeness of the invisible God in human form, which is what the message of the Bible is all about. To assist the reader in their study, I have numerically superscripted the Greek word and corresponded it with the closest English word in the italicized commentary that follows. This is to create a direct comparison of words between the two languages. Many words used in previous translations have adopted meanings in time that distract from the original thought. Individual words can greatly influence the interpretation of any conversation. For years deliberate as well as oblivious errors in translations were repeated and have empowered the religious institutions of the day to influence, manipulate and even abuse masses of people. Consider the word metanoia, consisting of two components, meta, together with, and nous, mind, suggesting a radical mind shift. This word has always been translated as "repentance," which is an old English word borrowed from the Latin word, penance. Then they added the "re" to get even more mileage out of sin consciousness. Re-penance. This gross deception led to the perverted doctrines of indulgences, where naive, ignorant people were led to believe that they needed to purchase favor from an angry god. Most cathedrals as well as many ministries were funded with guilt money. The Bible is a dangerous book! It has confused and divided more people than any other document. Scriptures have been used to justify some of the greatest atrocities in human history. People were tortured, burned to death and multitudes murdered based on somebody's understanding of the scriptures! Jesus, Paul and believers throughout the ages faced their greatest opposition from those who knew the scriptures. If it is such a dangerous document, how does one approach the book? 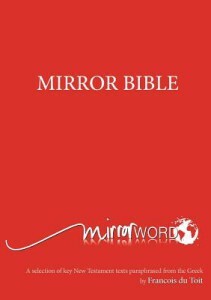 The Mirror unveils the Incarnation Code as the key that unlocks the mystery message of scripture. The romance of the ages is revealed here. The good news may be the best news you never heard! The good news declares there is nothing you can do to make God forgive you, accept you, or favor you because all the blessings of heaven are freely yours in Christ Jesus. They are lavished upon you according to the riches of his grace. At a time when many are hearing mixed messages about the love of God, The Gospel in Ten Words is a welcome reminder of the good news revealed by Jesus. It is an invitation to return to the unmixed and liberating gospel of the apostles. This book will take you to the heavenly treasure rooms of grace and leave you awestruck at the stunning goodness of God. You will discover the secret to walking in divine favor and experiencing freedom in every aspect of your life. You will learn who you really are and why you were born. Best of all, you will come face to face with the One who has called you to the thrilling adventure of living loved.